Bingo @ Carbondale Beer Works Come have a beer, play some Bingo, and win awesome prizes all while supporting our furry friends in need at Colorado Animal Rescue! 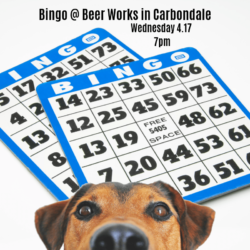 The April 17th BINGO at Carbondale Beer Works will be a benefit for C.A.R.E. $1 cards, lots of amazing prizes, free pints, and merriment galore. Games start at 7:00. Visit the Facebook event page or C.A.R.E. 's website to learn more!